Producing superior quality quick printing/copying of black and white documents through high volume digital printers, Island Blue offers fast turnaround at competitive rates. High resolution quality means exceptional photo clarity and graduated gray scales equaling that of offset printed materials. Supplied original documents can be scanned, archived and retrieved at any time for future printing requirements. Professionally finish your manuals and reports using a variety of binding and finishing methods best suited to your presentation: cerlox, plastic coil and wire binding, three hole punching and staple/folding for booklets. Black/white toner printing at 156 line screen for quality photo reproduction. 8.5" x 11" up to 12.5" x 18.5" on some stocks. 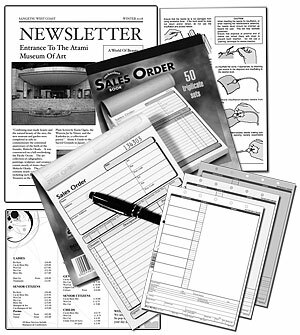 Smaller items than the standard sheet (8.5" x 11") are printable, but must be imposed and cut from the larger sheets. Let us know what your needs are.